When we marry, we have fairy tale dreams. We imagine love and romance twenty-four hours a day, seven days a week. We expect great things and endless love. This dream has one major flaw: a marriage is made up of two human beings. 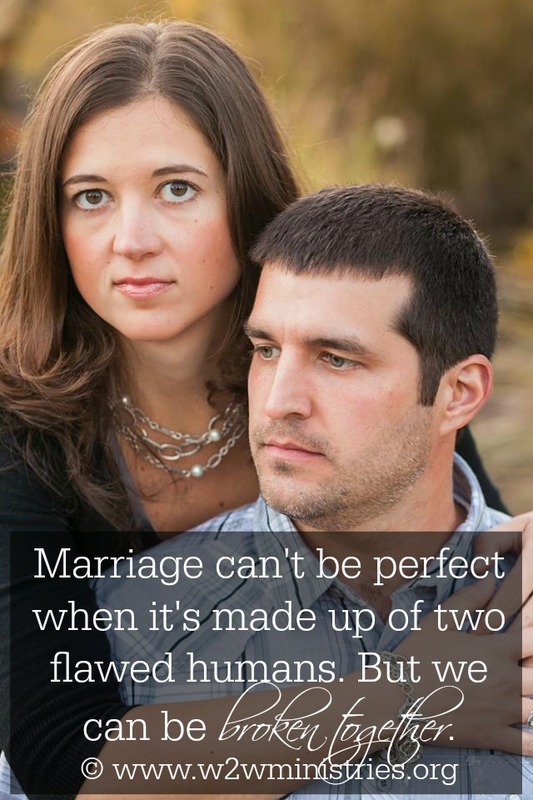 Marriage cannot be perfect because we are not perfect. There will be times where we disagree and times where we are broken. One day we will look up and the once cute quirks of our mate will now be irritating. One day your mate will struggle with something and will be broken. And one day you will struggle with something and you will be broken. How can we make a marriage work when we are broken? In those times of brokenness, stay close to God. Pray. When your husband is struggling with something, pray for him diligently. Let him know that you are here for him when he is ready. When you struggle with brokenness, ask your husband to hold you in prayer and talk to him when you can. And when your husband's quirks just downright annoy you, pray that God would give you a love for him that is stronger than annoying habits. We don't have to fall apart just because things are hard. We can stick together with the glue of Jesus. Be broken with your husband. Hi Jenifer, I remember thinking that, the fairytale has ended. Not a great moment I can tell you. But i love how you say, to be broken together. If i look back that certainly has been the way of things in the Lord in my marriage. Today I can say our growing together might actually be better than any fairytale. Great post my sweet friend. Loved it.